I've had a very annoying week. My phone line was down so no land line or internet and a few missed calls along the way - grrrr! And last thursday I dropped my laptop on the train, resulting in a cracked screen - more grrrr! I'm getting a nice local guy to fix it and he'll put in a matt screen, so at least I'll have a small improvement with the newbie. At the moment I'm working on the laptop with the lcd pulled out and my old monitor plugged in, so at least I can still use it. I have lots of writing to do - a paper, two proposals and a brief, so I need to get cracking. Some bought time is something I could use right now, free time even better. 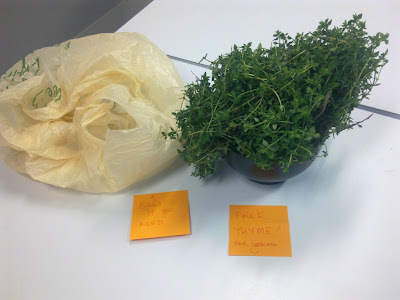 I'll just have to be content with the memory back in late September 2010 of my offering of free thyme in the RMIT lunch room! I believe that Mick and Feride have some of this dried in their kitchen - maybe they've used it already!